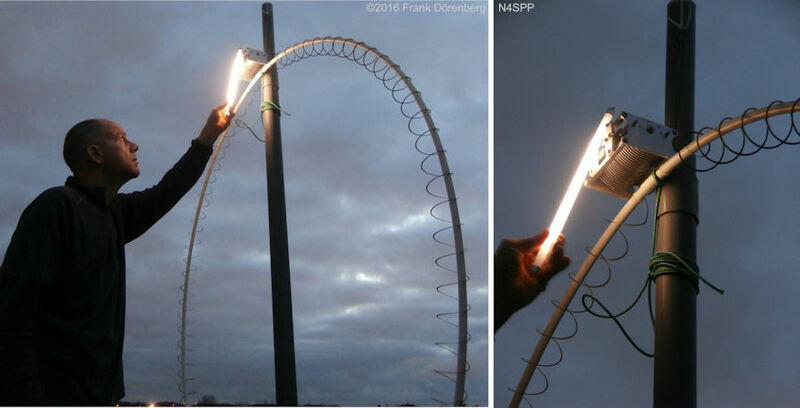 During the year-end vacation of 2016, I decided to do some quick "Mag Loop" antenna experiments. I re-used one of the two brass Slinky® coils from my Slinky®-coil short multi-band dipole to make a Small Transmitting Loop antenna. Nothing new (ref. 1C-1E), but easy to build and I was curious about its characteristics. For a general introduction to Small Transmitting Loop antennas (STL, a.k.a. "Magnetic Loops"), incl. coupling methods, please see my 80-20 STL page. A standard Slinky® is a toy made from a flexible 90-turn metal spring. It has diameter of 2¾ inch (≈7 cm). Slinkies have been popular since the 1940s and can still be bought today. Each Slinky contains about 67 feet (20 m) of flat steel wire (1/10 inch wide), and weighs approximately ½ pound (225 gram). Compressed, a Slinky coil is only 2¼ inch long, but it can be stretched into a helix as long as 15 feet (4.5 m) in length - without deforming it permanently. A Slinky is made of 67 feet of steel wire. However, a 15 ft long antenna made with a Slinky coil does not have an electrical length of 67 ft! The Slinky-wire is "helically" or "spirally" wound - basically a cylindrical coil. 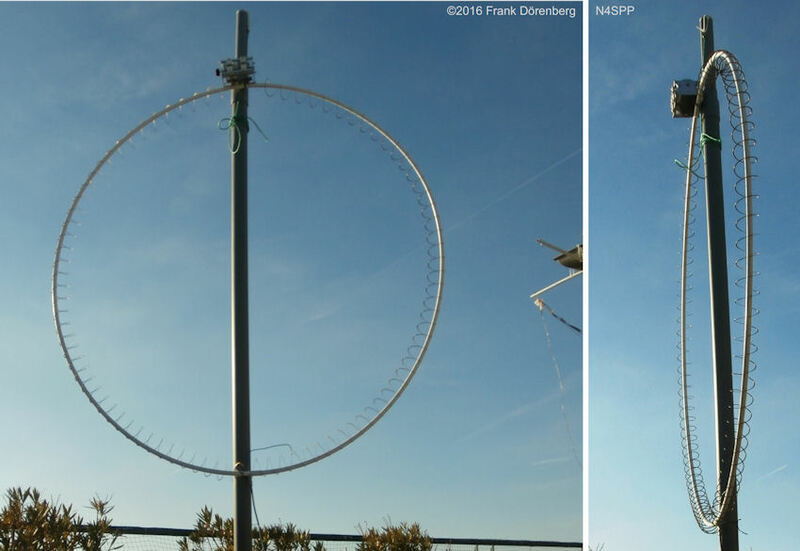 The diameter of the coil is small ( < 0.5%) compared to the wavelength that the antenna is used for. Likewise, when the coil is stretched, the pitch of the turns ( = axial distance between successive turns) is similarly small. In this case, the antenna is called a "normal-mode" helix. In this mode, the coiled wire has maximum radiation in directions perpendicular to the axis of the coil. 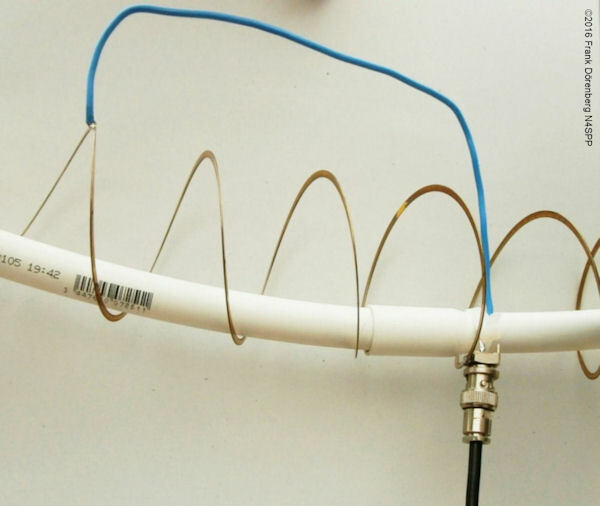 The coiling of the wire adds inductance that is distributed all along the antenna. I.e., the antenna has built-in continuous inductive loading. As the loading is obtained by the helical shape of the antenna wire, it is also referred to as "helically loaded". As with any inductor coil, the Slinky also has distributed parasitic capacitance. A standard Slinky coil resonates as a quarter wave between 7 and 8 MHz, when it is stretched to a straight length between 5 and 15 feet. Note: the standard Slinky coils made of very inexpensive low-quality steel and are not corrosion protected. Severe corrosion will happen very quickly, due to weather exposure, and to some extent due to RF energy when transmitting. Steel antenna wire has higher loss than copper wire - something that we definitely do not want in an STL. They are also not easy to solder. To mark the 40th anniversary of the Slinky product, brass coils were made. Their availability has become very limited ( = expensive)... I bought mine in 2008. 1 brass Slinky coil. As stated above, a standard Slinky coil has 90 turns. After other experiments, my brass coil has 86 turns left. Obviously, a loop made of a Slinky coil will not maintain a loop-shape by itself, without support. The resulting loop circumference is 5 m (≈16½ ft). I.e., a loop diameter of 1.6 m (5+ ft) - just perfect for one Slinky coil without overstretching the coil turns, or too small turn spacing ( = risk of adjacent turns touching each other). PVC with 16 mm OD is flexible enough to be formed into a loop. yet stiff enough to support the loop and maintain the loop shape. At our local DIY-store, one end of each tube section is belled ( = inside diameter increased to the outside diameter). So you can insert one section into another, without needing a female-female PVC coupling piece. The Slinky coil is not attached to the PVC loop anywhere! 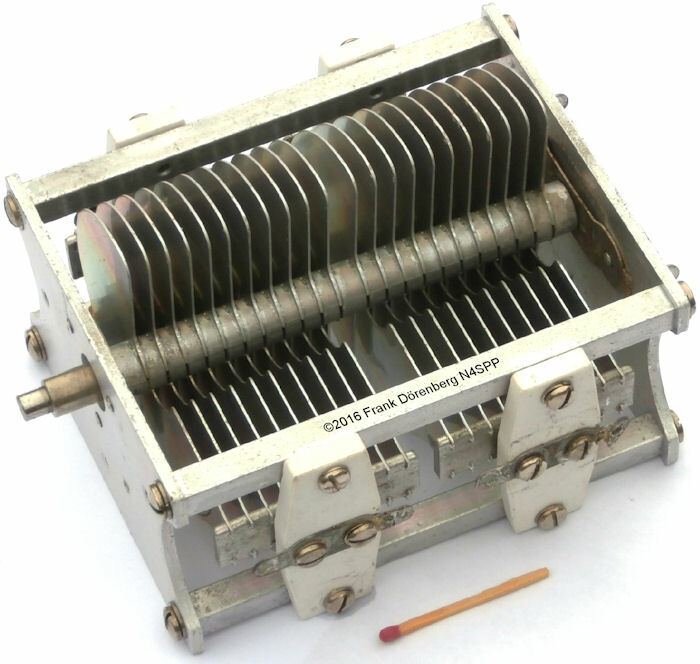 Once both ends are connected to the tuning capacitor, the coil stays in place all by itself. Due to the springiness of the coil, the coil turns are spread out evenly. Due to the low weight of the PVC tubing and the coil, a fairly round loop shape is maintained, without sagging out into an oval. A tuning capacitor. See the "Tuning capacitors" section of my general STL-page. I decided to use an old Hammarlund air variable capacitor, as it is easier to connect wire to it than to my vacuum capacitor, which is easier for experiments. It is also much lighter. This capacitor is a dual-section type, 2x 36-240 pF. I put the two capacitor sections in series: only the two stators are connected. The rotor (and the sliding contact) is not connected. This configuration doubles the voltage rating. At the same time, it cuts the capacitance range in half: I measured 24-125 pF. This 1:5 capacitance range is relatively small, and results in a 1 : √5 = 1 : 2.2 tuning range between min and max resonance frequency. For instance, to cover the 80 and 40 mtr bands. Antenna mast - my standard solution: a 2.5 m section of PVC tubing with an outside diameter of 63 mm. It slides perfectly onto my heavy cast-iron umbrella stand. Ferrite toroid (types FT140-43 and T240-31) for a transformer coupling. With the tuning capacitor at its maximum capacitance (125 pF), the resonance frequency was 3.47 MHz. A same-size loop made of 16 mm (5/8") OD copper tubing would have required a capacitance of 450 pF to get down to the same resonance frequency. This also implies that it should be possible to tune down to 160m "top band" with a capacitor that has a maximum value of at least (3.4 : 1.8)2 x 125 pF = 3.6 x 125 = 445 pF. My 15-510 pF vacuum variable capacitance would be suitable for that. Obviously, antenna efficiency on 1.8 MHz will be poor - as is often the case with antennas that are far from full-size (and for 160 mtrs, "full-size" is really BIG). My LC-meter indicates that the inductance of the coil-loop by itself is 30 microhenry. As to be expected, this is much more than a standard single-turn loop (typically several microhenry). The 5 m circumference of this loop by definition makes it a Small Transmitting Loop on 80 and 40 mtrs. This was confirmed by some transmission tests that shows stronger signals in the direction of the loop-plane (i.e., not perpendicular to the loop). Without the tuning capacitor ( = capacitor disconnected on one side), the self-resonance frequency (due to parasitic capacitance) was 12.5 MHz. 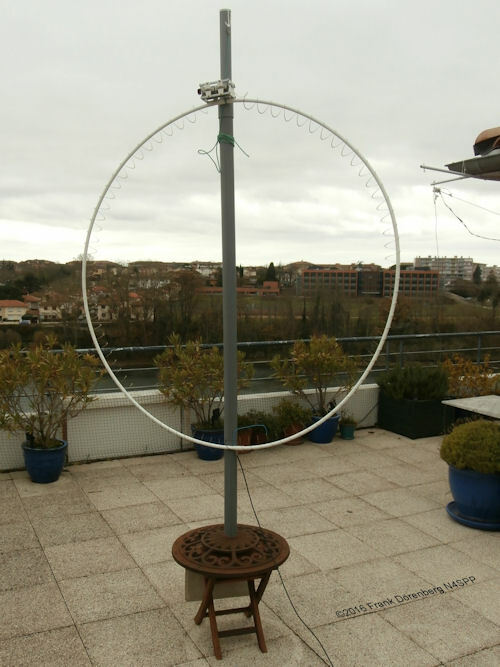 This is the highest resonance frequency that can be achieved with this antenna - without reducing the number of turns of the Slinky. I have observed a frequency drift of 0.5% (20 kHz around 3.6 MHz !) when dense fog moved in, while temperature only changed 0.5 °C (≈ 1 °F). The high humidity not only causes increased capacitance of the variable capacitor, but also increases the parasitic capacitance between the many turns of the Slinky coil. I did not notice a significant simultaneous increase in the SWR-bandwidth (but did not specifically look for this either), despite a lot of dew appearing on the coil and the capacitor. GAMMA TAP COUPLING. It took some adjustments to get the Gamma Tap coupling to work. To get a nice SWR of 1.2 around 3.6 MHz, I ended up with a tap across only 1½ coil turns from the neutral point ! However, this resulted in an SWR of 2.7 around 7 MHz. I compromised with a tap at 3½ coil turns (≈4% of the loop circumference), to get an SWR of 1.4 around 3585 kHz and 1.8 at 7045 kHz. This is manageable. SWR=2 bandwidth is 18.5 and 24.3 kHz, respectively. Ref. 1E states "...The Slinky-Hula design is unusual in that unlike magnetic loops which use a very thick tube as the single turn coil, it does not have very high r.f. voltages across its tuning capacitor. Even more surprising is the really enormous bandwidth of the antenna". Clearly, Fig. 5 and 7 do not agree with that. Note that the author of ref. 1E did use only 30 turns of a high-loss steel Slinky. My 84-turn brass Slinky has lower loss resistance than that. However, the linear length of the Sllnky wire is much larger than the circumference of the loop, so the loss resistance is larger ( = lower Q) than that of a tubular loop. FERRITE TRANSFORMER COUPLING. With a small FT140-43 ferrite toroid (material mix #43), I got best SWR with 3 secondary turns: SWR < 1.8 over the entire frequency range. Not great, but with such a 1:N transformer, N can not be fine-tuned. Although: it would be possible to pass 2 or even three coil turns through the ferrite ring, and make a 2:N or 3:N transformer. But it would not be easy to prevent the coil turns from touching each other where they pass through the ferrite ring. I did not try this. The FT140-43 ferrite stayed cool at 50 W but got very hot at 100 W key-down. I then tried a large FT240-31 (material mix #31) toroid. No more heating with continuous key-down at 100 W.
I tried both 3 and 4 secondary wire turns. I settled for 4 turns, to get better SWR on 80 mtrs. To test antennas by myself, I typically use remote receivers on the internet: Web-SDRs. I ran some quick tests on 40m during the afternoon of New Years Day 2017. 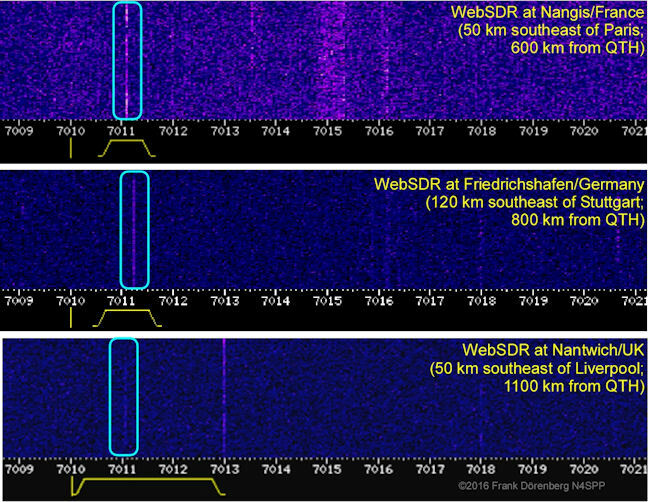 The screenshots below are from the waterfall display of Web-SDRs near Paris, central England, and the south of Germany. They are at a distance of about 600 km, 1100 km, and 800 km (350/700/500 miles) from my QTH in the south of France. Around sunset, I could not see my carrier signal on 80 mtrs. I noticed that the resonance frequency dropped about 40 kHz when I raised the bottom of the loop from 45 to 90 cm (3 ft) off the ground. 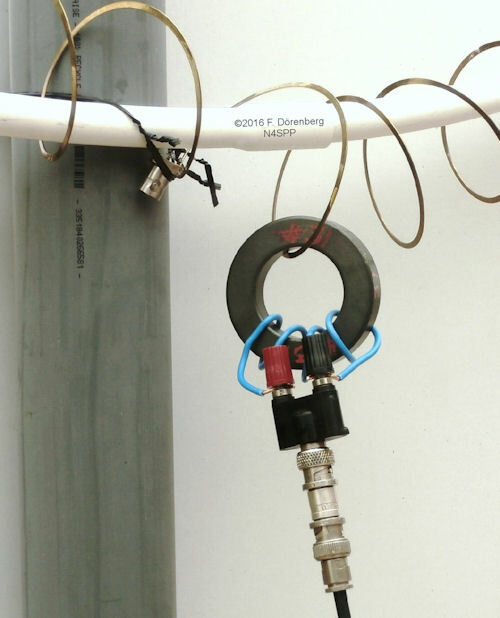 WARNING: if you are experimenting with the various forms of coupling, do NOT leave a ferrite ring on the loop and transmit via, e.g., a Gamma coupling! The ferrite ring will try to act like a current choke and will probably get fried (you will see the SWR increase when that begins to happen). ©1999-2017 F. Dörenberg, unless stated otherwise. All rights reserved worldwide. No part of this publication may be used without permission from the author.